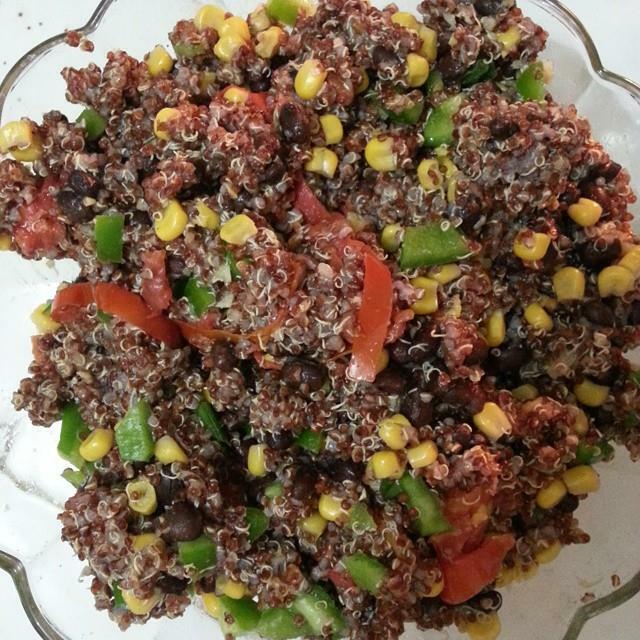 So for dinner last night I made a blackbean and quinoa salad served warm with green peppers, tomatoes sautéed in garlic and corn. I topped it with toasted sesame seeds just cause I had some on hand and sprinkled sea salt and lime juice over it all. It was amazing to me. Simply beautiful. The only thing that would have made it better for me were if I had an avocado to add to the dish but alas they’re going out of season here in Jamaica now. They’re being replaced by mango so I won’t complain much as I love mangoes. Munchkin, on the other hand, wasn’t as excited about this dish as was I. I miss the days that my little one ate anything passing her mouth. These days after the introduction of worldly fast foods to her palate, she’s a lot more choosy. She complained that she didn’t like it and whined about having to eat it. So I put her in front of me and fed her like a diligent and dedicated mother. The nutrients inside this salad are so wholesome and important that I knew I had to get her to eat it. With munchkin, she’ll whine and complain but if you feed her she’ll scarf it all down so I did my due. Some days, like when I cook curry chicken with mixed veg and potatoes, it’s not as difficult, but I want her to have a little bit of everything in her diet and I definitely want her to be used to eating well from early on. Why won’t I let a kid be a kid? Oh, she has plenty opportunity for that. She gets free reign at school as I long gave up the lunch box fight and now allow her to purchase her lunch at school which is normally one of three things: bun and cheese, pizza or cheese and beef patty. She isn’t a fan of the cooked lunch options and even on days when they have fried chicken and fries, she orders it and eats a bit of the fries and never the chicken. That may be a hazard of not actually knowing how to pick up a piece of chicken and biting into it like most people do because I only eat the chicken breast and so mainly cook boneless breast cutlets diced with veggies or beans at home. She rarely gets fast food as I try to keep that in check. It’s how I gained all the weight in high school and never really learned to eat better until adulthood. If she gets fat later on in life, it definitely will not be because she doesn’t know better! She get’s kiddie snacks in her lunch box as well as fruit to accompany her less than stellar lunch. I find that kids rarely eat at school anyway. At least mine. They’re more concerned with maximising playtime and so they nibble on stuff when they’re famished. Her breakfast is always some type of porridge and so I’m sure this probably keeps her full well beyond their early lunchtime as well. When munchkin gets home from school she’s usually starving and I take this opportunity to stuff her with healthy snacks like plain yoghurt and fruit and then a healthy dinner. She used to be an avid green juice drinker like her mommy but she’s not a fan anymore. I have not given up hope; soon I will find a recipe that includes greens hidden in there that she likes. I believe the one I recently had at Loshusan’s Juice Bar might be an option as it was spinach, grapes and carrots. It was deliciously sweet but I’m not sure how often I can reproduce that at home as grapes are expensive here. I am thinking of using icicle pops instead as she loves them, blending berries and greens and freezing them in a mold may just be the solution. We’ll see how this works out soon. There for sure are days when a plate of boxed macaroni and cheese and sausages hits her table but can one think of anything else more unhealthy? Ugh! I definitely try to keep those days to a minimum and make sure I always have something quick and healthy for when I’m pressed for time or simply not in the mood to cook. Some days that amounts to boiling a piece of sweet potato and shredding cheese over it. Not much but so much better than processed Kraft mac and cheese and chemical laden animal waste aka sausages. I’m invested in her health and I know how important it is that she has an appreciation for eating healthy from now. We reap the benefits of this all the time already as she rarely gets sick no matter what’s going around the classroom. The last time she had an issue was with chikungunya and the height of hers was a fever for a couple days. Amen. How to do you keep your little one fed and healthy?